In early 2017, the One Percent Fund started supporting the “Dairy cows for poor rural women” project in eastern Uganda. The aim of the project is to promote sustainable agricultural livelihoods through dairy farming. The local NGO Pamo Volunteers has provided each of 27 women in Kumi District with a pregnant heifer. These particular mixed-breed cattle were recommended by the project’s veterinarian as suitable for the region. They can resist common cattle diseases, and they produce a large amount of milk. While the 27 women will keep their cows, the resulting calves will be given gratis to other women. One cow has already delivered a calf. The cows produce enough milk for the families’ own needs while leaving enough for them to sell for income. 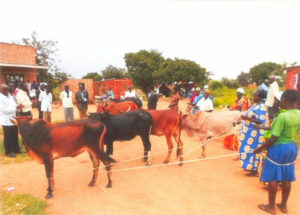 The women received three days of training in how to keep cows. The cows live on their new owners’ existing property, which are being planted with fodder. Benefits from the project will include sustainable incomes, improved childhood health, higher school enrolment, manure-enhanced soil, skills in how to train others, and spin-off projects in other communities. Government officials and local clergy participated in the project launch, indicating the strong level of community support that the project and the participating women are receiving.